How do some of our best poets reflect death in their opaque art? What do their death poems tell us about our lives, about our faith and the objects of our faith and about the shape of our doubt? 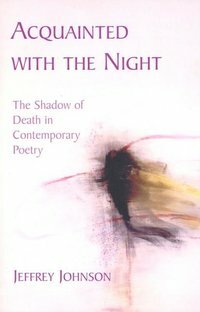 Acquainted with the Night is a study of death as it appears in the work of a handful of contemporary poets Geoffrey Hill, Scott Cairns, Mark Jarman, R. S. Thomas, and Wendell Berry. The primary focus throughout is directed to the appearance of death, and to the physical and metaphorical darkness often associated with the thought of death, in their poems. Jeffrey Johnson s commentary frames each poet s work within observations by literary artists and critics, theologians, cultural critics, and scholars of religion, providing a Christian appreciation of each poet s work within a context of tradition and circumstances. Readers equipped however lightly with the words of scripture and the mandates of faith may find in these poems terms of reference, rhythms, images, themes, and concerns that strike sympathetic chords and enrich the experience of faith and life."